Background: There are no studies on pathways to psychiatric care in patients seeking help at private psychiatric hospitals in India. Aim: This study aims to study help-seeking behavior and pathways to care among patients-seeking treatment at a private psychiatric hospital in North India. Subjects and Methods: Fifty newly registered patients were assessed for their help-seeking behavior and pathways to care before seeking the current consultation. Descriptive analysis was performed. Results: Most of the patients sought help either as self-referral or on advice of their relatives, friends, and other patients. Eighty percent of patients had seen a care provider within 1 month of onset of their symptoms. Forty-eight percent patients approached a psychiatrist while 34% approached a faith healer or unqualified local practitioner as their first care provider. Conclusion: Patients with mental illnesses vary in their help-seeking behavior with regard to their choice of first care provider, time to reach a psychiatrist, and number of care providers sought for their mental health problems. Following the WHO cross-cultural study on pathways to psychiatric care by Gater et al. in 1991, a number of studies have been reported from Western and developed countries,,,, developing countries,, as well as from India.,,,,,,, These studies were mostly carried out at tertiary hospitals in the government sector. There are no studies on pathway to psychiatric care in private sector at district level in India. The services of private sector in the field of psychiatry in India can be traced way back to British raj era. The economic growth has given patients the opportunity to use private sector psychiatry care as an alternative to over-burdened government hospitals. Currently, the private sector contributes about one-third to half of the specialist mental health services making the private sector psychiatric care as an integral part of mental health services in India. It is not known if the pathways to psychiatric care and help-seeking behavior in patients seeking treatment in private mental healthcare settings are different from those seeking treatment in government and nongovernmental organizations (NGO) sectors as there are no previous studies on pathways to psychiatric care from private mental health settings. We planned to conduct this study at a district level private psychiatric hospital in North India to have some preliminary understanding of pathways to psychiatric care and help-seeking behavior of patients-seeking treatment in private settings. The understanding gained from this study can supplement information from similar studies in other sectors in India to plan more comprehensive interventions to improve help-seeking behavior of people with mental illnesses. Data analysis: Predictive Analysis Software Statistics-18 was used for statistical analysis. Descriptive statistics were calculated. The sample had mean age of 31.02 years (standard deviation 11.40, range 13–55 years) years. Majority of the participants were male (60%), married (74%), and came from rural areas (86%). More than one-third of them (36%) had studied up to senior secondary or higher. Twenty-one patients had a diagnosis of schizophrenia or other psychotic disorders, 21 had affective disorder, and 8 had anxiety, neurotic, and stress-related disorders. The median duration of illness was 12 years. Majority of the patients had continuous illness (68%) and had a sudden onset (60%) of their illness. Forty-eight patients had sought treatment at other places before seeking current consultation. 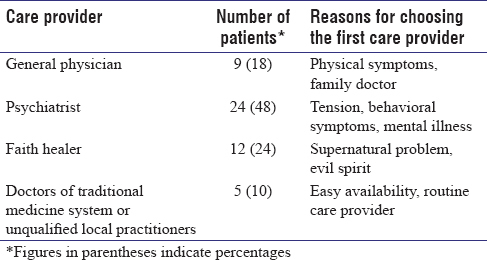 Nearly half of the patients went to psychiatrist at the first instance whereas one-fourth sought help from faith healers as their first healthcare provider [Table 1]. Before the current consultation, 13 patients had sought treatment from general physicians, 41 from psychiatrists, 14 from faith healers, 6 from unqualified local practitioners, and 1 from traditional medicine doctor. Many of them had seen multiple care providers, namely 74% approached more than 1 care providers, while 52% approached more than 2, and 28% approached more than 3 care providers. Most of the patients (12 out of 14) who sought treatment from faith healers did it at their first port of seeking help because they considered their problem due to evil spirits and supernatural forces. Most of them had a diagnosis of a psychotic disorder. Other two patients consulted faith healers after they did not get relief with treatment from a general physician or unqualified local practitioner for their physical symptoms such as insomnia and weakness. Forty patients (80%) did seek help from a care provider within 1 month of onset of symptoms, and the remaining patients sought help within the next 6 months of onset. However, only 46% of the patients reached to a psychiatrist within 1 month of onset of their symptoms and one-third (30%) of the patients took longer than 6 months to reach to a psychiatrist. Most of the patients came themselves or were brought by their families. Many of them sought help on the advice of their relatives, friends, or other patients. Two patients were referred by general physicians, one by another psychiatrist, and one by unqualified local practitioner. No patient was referred by faith healers or medical specialists such as surgeon, neurologist, and cardiologist [Table 2]. This is the first study on pathways to psychiatric care from the private mental healthcare setting in India. The earlier studies on this subject were either from government sector,,,,,, or NGO sector. Mostly, 86% of the patients in this study came from the rural areas in contrast to the patients with urban preponderance in the majority of the previous studies from India, a difference attributable to thousands of villages in the catchment area of the current study's center. The findings of this study may supplement other studies for more comprehensive understanding of help-seeking behavior of people with mental illness in India and may emphasize the need to include private sector as one of the stakeholders in community-based mental health programs such as the District Mental Health Program. Most of the patients approached a care provider within 1 month of onset of symptoms. This reflects a positive aspect of the help-seeking behavior of patients in this study from an affluent area having a fertile agricultural belt in North India. A psychiatrist being the first care provider in nearly half of the patients is another welcome finding. In previous studies from India, number of patients having psychiatrist as the first care provider varied between 8.3% in a study by Gupta et al. from a tertiary general hospital to 57.7% in a study by Chadda et al. from a psychiatric hospital. In two recent studies from Madhya Pradesh and Rajasthan, with predominantly rural subjects, 9.2% and 15% of patients had a psychiatrist as the first care provider. The difference may be due to better availability of psychiatric services in the area where the current study was carried out. However, it was striking that about one-fourth of the patients chose to approach faith healers over the other care providers. It appears that initial help-seeking behavior of these patients and their families were influenced with superstitions and misconceptions still prevailing in the rural population in India. It appears that subjects in this study varied in their help-seeking behavior for their mental illnesses, which may be because of differences in their awareness about mental illnesses and available treatment. Nearly half of the patients sought help from a psychiatrist at the first instance while about a fourth chose to go to faith healers for their mental illnesses. Whether this variation indicates the presence of two distinct population subgroups having differences in their awareness, attitude, and help-seeking behavior needs further examination in a separate study on a larger sample. Majority of the referral were self-referral which may be due to the prevailing reputation of this private psychiatric hospital in this area. About one-fourth sought help on the advice of their relatives or friends, a common trend observed in the pathway studies in India,,,,,,,, implying that people in India rely a lot on advice of their friends and relatives for their healthcare-related decisions. Time to reach a psychiatrist for treatment after the onset of symptoms is a good indicator of help-seeking behavior among patients with mental illnesses. Half of the patients in this study reached to psychiatrist within 1 month of onset of their symptoms (likely the “well-aware group”), a finding that is similar to a previous study from North Rajasthan and may reflect the well-developed psychiatric services in the area (both study sites have similar catchment areas). Patients in some of the other studies from India have taken longer to reach a psychiatrist.,, However, one-third of the patients in this study also took longer than 6 months to reach a psychiatrist, though they had approached other caregivers well in time. The delay in reaching to psychiatrist among those patients who sought help from the other care providers at the first instance indicates that these care providers do not refer patients with mental illnesses to a psychiatrist. This may be either due to lack of awareness among other care providers or due to lack of networking and liaising between them and psychiatric services. This may also be due to their own commercial (and existential) interests superseding the interests of patients. The finding emphasizes the need to provide training to nonpsychiatric healthcare providers and establish networking with them to improve the pathway to psychiatric care and to reduce delay in seeking treatment from a psychiatrist. The study has certain limitations. The study was conducted in an inpatient setting of a reputed and well sought private hospital in the area. Therefore, the findings cannot be generalized to all patients-seeking treatment in private mental healthcare settings. Recollection bias and retrospective falsification might have affected the information provided by the patients or their family members. Willingness of the subjects to share information about their previous caregivers might also have affected the information. Some people may not want to acknowledge that they were seeing a faith healer or other traditional care provider. Small sample size was another limitation precluding valid statistical analysis for relationship between various aspects of care to pathways, such as first caregiver or number of caregivers and time to seek treatment from a psychiatrist. This first-ever study on the pathway to psychiatry care in a private setting at district level in India indicates wide variation in help-seeking behavior of patients with mental illnesses, even in a predominantly rural sample. This variation was clearly evident from their selection of first care provider (faith healer versus psychiatrist), number of care provided visited before current consultation and time to seek treatment from a psychiatrist, three important indicators on the pathways to psychiatric care. The study highlights the necessity to include nonpsychiatric caregivers in the community mental health services. Community-based mental health programs should integrate private, public, and nonprofit sectors to meet the unmet mental healthcare needs in India. Behari M, Gupta DK, Singh V, Verma KK, Sengupta SN, Sidana R, et al. Help seeking behavior and pathways to care among patients seeking care at a community mental health clinic and psychiatry outpatient department of a medical college: A study from North Rajasthan. J Ment Health Hum Behav 2013:18:18-33. Giasuddin NA, Chowdhury NF, Hashimoto N, Fujisawa D, Waheed S. Pathways to psychiatric care in Bangladesh. Soc Psychiatry Psychiatr Epidemiol 2012;47:129-36. Vázquez-Barquero JL, Herrera Castanedo S, Artal JA, Cuesta Nuñez J, Gaite L, Goldberg D, et al. Pathways to psychiatric care in Cantabria. Acta Psychiatr Scand 1993;88:229-34. Balestrieri M, Bon MG, Rodriguez-Sacristan A, Tansella M. Pathways to psychiatric care in South-Verona, Italy. Psychol Med 1994;24:641-9. Gureje O, Acha RA, Odejide OA. Pathways to psychiatric care in Ibadan, Nigeria. Trop Geogr Med 1995;47:125-9. Naqvi HA, Khan MM. Pathway to psychiatric care in Karachi. J Coll Physicians Surg Pak 2006;16:438-9. Gupta DK, Kumar A, Maulik P, Kumar P, Saxsena S. Pathways to psychiatric care a study from North India. Indian J Psychiatry 1998;40 Suppl 1:110. Garg R, Sidana A, Chavan BS. Factors associated with treatment lag in mental health care. J Ment Health Hum Behav 2011;16:12-7. Faizan S, Raveesh BN, Ravindra LS, Sharath K. Pathways to psychiatric care in South India and their socio-demographic and attitudinal correlates. BMC Proc 2012;6 Suppl 4:13. Available from: https://www.ncbi.nlm.nih.gov/pmc/articles/PMC3426139/. [Last accessed on 2016 Oct 07]. Somasundaram O. Private psychiatric care in the past: With special reference to Chennai. Indian J Psychiatry 2008;50:67-9. Desai NG, Tiwari SC, Nambi S, Shah B, Singh RA, Kumar D, et al. Urban mental health services in India: How complete or incomplete? Indian J Psychiatry 2004;46:195-212. SPSS Inc. PASW Statistics for Windows, Version 18.0. Chicago: SPSS Inc.; 2009.